...thank GOD someone finally came up with this! Using two hands to change the roll is simply unbearable. 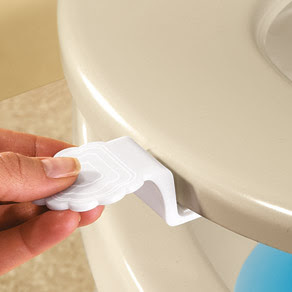 "Self-adhesive handle installs in seconds to any toilet, allowing you to lift or lower the seat without touching it. 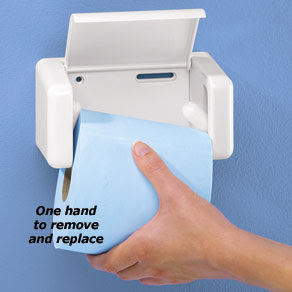 Easy to use and easy to keep clean, it helps protect hands from toilet seat germs." Excuse me? Is it easier to use and keep clean than that toilet seat itself? Does the beautiful scalloped edge keep germs at bay? And who Photoshopped that blue water onto the picture? Sorry, but they should be fired. It's not even remotely the right shape. That's right. 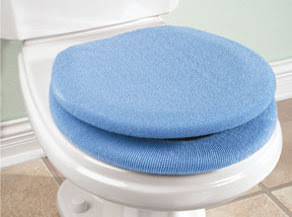 For all you folks who are worried about germs being able to cling to the slick surface of your toilet seat, this new acrylic/poly knit cover will give them the extra traction they need. For those who can't find this item for sale in your area, you might consider just winding yarn around your toilet seat. I thought Jesus was a carpenter? 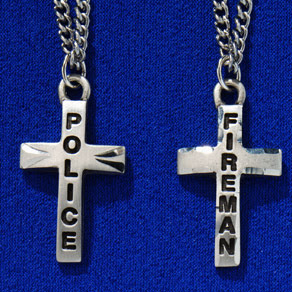 Or maybe they're suggesting we crucify the police and firemen? Not sure. Further damage done to intercostal muscles. Back in the day there was a fantabulous blog called You Knit What?? the perusing of which each morning set me up for the entire day. I thought for a moment that the blue seat cover was CASHMERE...wouldn't that be another utterly unnecessary luxury item...but I bet it would sell! rr said: "Perhaps you should have a special blog category for product ponderings... :-D"
I like that idea. It could be really fun. I am afraid though that if this blog actually had a purpose I'd feel more compelled to post everyday. Could I handle the pressure? brandy101 said: "CASHMERE" Did you see that Stephen Colbert show? Why do my links never work in blogger comments? I must not be doing the HTML right. I don't even want to think about that toilet sweater. I'm sure to have nightmares now.